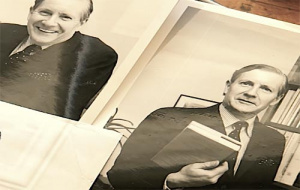 Sandy Nairne CBE FSA (1971, History), Honorary Fellow and former Director of the National Portrait Gallery, is assembling and hoping to publish The Coincidence of Novembers: a selection of autobiographical writings by his late father, Sir Patrick Nairne (1940, Classics and History). Sir Patrick joined the Civil Service after distinguished service in the Second World War and rose to be Permanent Secretary. He was an Honorary Fellow of University College until his death in 2013. After Sir Patrick’s death, his children found a variety of texts in near final draft form, including a survey of key moments in his life, draft chapters on his childhood, accounts of the North African and Sicily campaigns with the Seaforth Highlanders, and a description of Hong Kong when he was overseeing the consultation process before the territory was handed back to China. The book will be published by Unbound, and was 93 percent funded as of 30 October. Sandy Nairne commented: “The Coincidence of Novembers is a phrase that my father, Sir Patrick Nairne, used to describe some of the most significant things had happened in his life and work. Now it is the title of a book I am creating of his writings (and watercolours), which will gives vivid glimpses of a life that encompassed much of significance in the second half of the 20th Century. If you would like to become a subscriber full information is online.